With Starting 11 contests this weekend, it’s time to get the site and community Gameweek 36 daily tips. You can challenge the community by downloading the FREE App on Android or iOS and create a team. There are separate games available for the fixtures on Saturday, Sunday and Thursday. Get ahead in familiarising yourself with the game ahead of their World Cup contests this summer. I foolishly sold Mohammed Salah in FPL ahead of Double Gameweek 34 and I’m now forced to stick by my decision to go without him! However, he’s in my Starting 11 team for Saturday and takes the armband. Salah has been in amazing form at home this season and with Mane rumoured to be injured, Salah’s starting place looks secure. Liverpool are carrying a useful advantage into the second leg of their Champions League tie. You have to look back to December for the last time he didn’t score at home in the Premier League. I’ll be cheering on the goals once more this weekend in my quest to win some Starting 11 cash in the Gameweek 36 daily contests. My tactic to max out on Double Gameweek players in 34, means that I don’t currently have any Manchester City players in my FPL team, so they dominate my Starting 11 midfield for Gameweek 36 daily games. Kevin De Bruyne scored a marvellous goal last weekend and will have his shooting boots on to challenge a leaky West Ham defence. Sane will be demonstrating the skill that led him to win the PFA Young Player of the year. Expect plenty of goals for Manchester City at the London Stadium this weekend, as they look to break every record going, and reach the 100 goal barrier for the season. 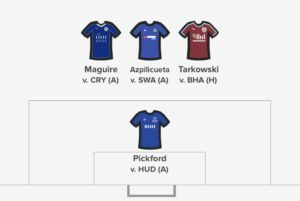 I’ve got Burnley, Leicester and Chelsea defenders in my FPL team: the luxury of Daily Fantasy is that no budget allows choice for the premium options. Jordan Pickford is the NEED pick between the sticks, with three clean sheets in his last six games. Conversely, Huddersfield have just two goals in their last six games, so expect a quiet Saturday afternoon for the Everton keeper. His ball distribution is excellent, so there’s always an outside chance of an assist for him too, although it’s perhaps a long shot! Good luck to you in your Gameweek 36 daily fantasy competitions. WORLD CUP FANTASY FOOTBALL: Before you go – whilst the Fantasy Premier League season is still 3 weeks from its end, the 2018 Russia World Cup is now looming! Keep an eye on the Live Blog over the next few days, for all of the community Gameweek 36 Daily Fantasy tips.